They were fresh off the boat – a group of Syrian refugees who had fled their homes, travelled halfway across Turkey and placed their lives in the hands of a gang of people smugglers. But when we met on the island of Lesvos this time last year, a young woman stepping onto Greek soil for the first time told me they had panicked only once during that perilous voyage: when their mobile phone signal disappeared. At that moment, she said, they realised they had lost their only link to the outside world. With no way of contacting family, friends or anyone who could help them, they were gripped by a fear and sense of isolation they had never before experienced. For most of us in the industrialised world – and everyone, without exception, at this year's World Economic Forum Annual Meeting in Davos – connectivity is a fact of life. Indeed, now that information is so freely available, we tend to worry more about overload than scarcity. With mobile phones, tablets and computers, with 3G, 4G and superfast broadband networks spreading across the globe with even greater speeds to come – and with an expanding choice of social media platforms, we are always in contact with each other. For refugees, life is very different. Globally, refugees are 50% less likely than the general population to have an internet-enabled phone, and 29% of refugee households have no phone at all. While 90% of refugees located in urban environments live in places with 2G or 3G mobile coverage, about a fifth of those living in rural areas have no connectivity at all. Connectivity is not a luxury. It is a lifeline for refugees. On the most fundamental emotional level, they are desperate to stay in contact with family members – some of whom may be still at risk of violence or persecution. Access to up-to-date information can warn them of new threats, such as disease outbreaks or the spread of conflict, or where to find food and water, clothing, shelter and healthcare. In the longer term, it can mean access to online teaching, thus improving their employment prospects, and then help in finding work. Scanning social media and listening to the rhetoric of some politicians, the outlook for refugees can seem bleak. For many refugees, the welcome they receive in the countries to which they flee is growing colder. But there is another side to the story – a narrative of welcoming grass-roots communities, volunteerism, compassion and solidarity. 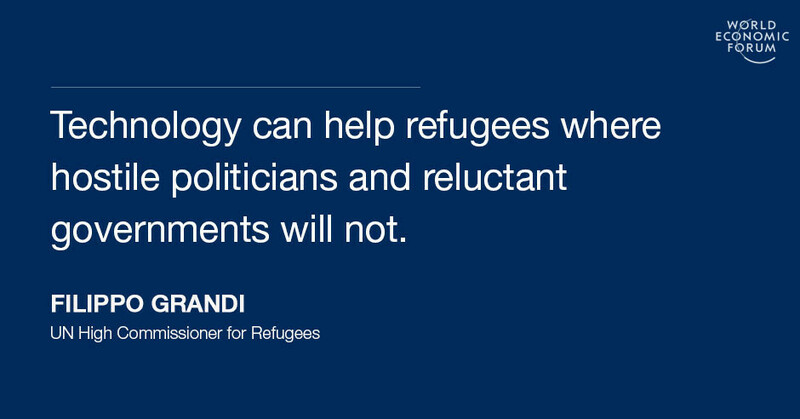 Technology, and the future of technology, can help refugees where hostile politicians and reluctant governments will not. In a world of total connectivity and unlimited data, we will be able to link refugees to the resources they need, such as education and training or medical and legal services. Refugees in turn will be able to communicate with agencies such as UNHCR using a broader range of channels than before, telling us what they need most, and what we’re getting right – and wrong. If we are smart in how we design digital aid systems, we will have the opportunity to broaden our partnerships to hundreds, if not thousands, of organisations willing to help refugees all over the planet. So we face two challenges: how to improve connectivity for refugees today, and how to position ourselves to best use it tomorrow. To facilitate both goals, we are asking governments to improve access to connectivity and the infrastructure that provides it. We encourage the private sector – particularly telecommunications providers – to give its support through technological expertise, global reach and spending power. To make any headway, refugees need access to affordable phones and computers, inexpensive phone and internet contracts, and training in digital literacy. And we urgently need innovations to improve the wifi access and capability in refugee locations by using microwave links, satellite dishes, unused TV spectrum, drones and balloons. By doing all this, we will be helping not just refugees but also the communities that host them – and since the vast majority of refugees are sheltered in developing countries, we will be bringing new technology to those who need it most. In 2014, my colleagues first encountered a young Syrian man called Hany, who with his family had fled the city of Homs and found refuge in a camp in Lebanon's Beka'a Valley. A poet, rapper, photographer and all-round force of nature, Hany was such a talent that it took my colleagues a while to realise he had a serious eye condition that meant he could only see a few centimetres in front of his face – he is, in fact, legally blind. For Hany, his mobile phone was utterly essential. It enabled him to learn English, take his first photographs and call for help. That same phone rang one day with the news that the city of Regina, Canada, was to be his new home. “My phone is my little world,” as he put it. For refugees, staying connected is not only a matter of survival. It provides a route to self-reliance and independence, boosting their own well-being and of the communities that host them. Last year, the World Economic Forum launched a programme called Internet For All. We must ensure that “All” includes refugees. Join the UNHRC’s #WithRefugees campaign by signing this petition.